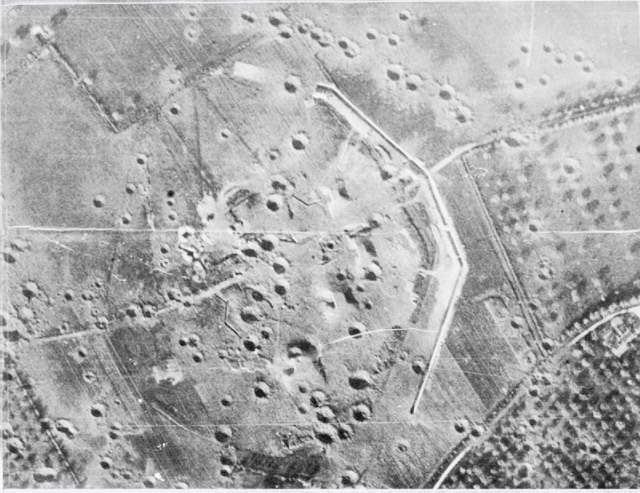 Airborne landings in the British Sector were targeted mainly at the Orne River/Caen Canal crossings and the artillery installations of the Merville Battery. The strategic purpose was to secure river crossings for the beach break-out and to reduce enemy defences. 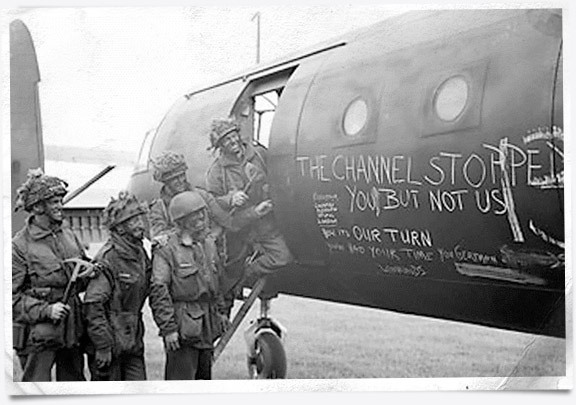 At 00:16 hours on 6th June parachutists and gliders from the Airborne Division, consisting of D Company of the Oxfordshire & Buckinghamshire Light Infantry, began to land east of the River Orne and the Caen Canal. The small force of 181 men was commanded by Major John Howard and joined with a detachment of Royal Engineers who landed at Ranville-Benouville in six 28-men Horsa gliders. Having taken off from Dorset, the gliders were towed across the Channel by Halifax Bombers. With perfect navigation and piloting skill, the gliders landed on time and on target within few yards of each other. Major Howard’s glider landed within a few feet of the canal bridge. The bridge was captured after a fierce ten minute fire fight, the action all over by 00:26, a full six hours before the beach landings. So, just 90 minutes after taking off from RAF Tarrant Rushton in England, Major Howard was able to send the code words “Ham and Jam”, indicating that both bridges had been captured. 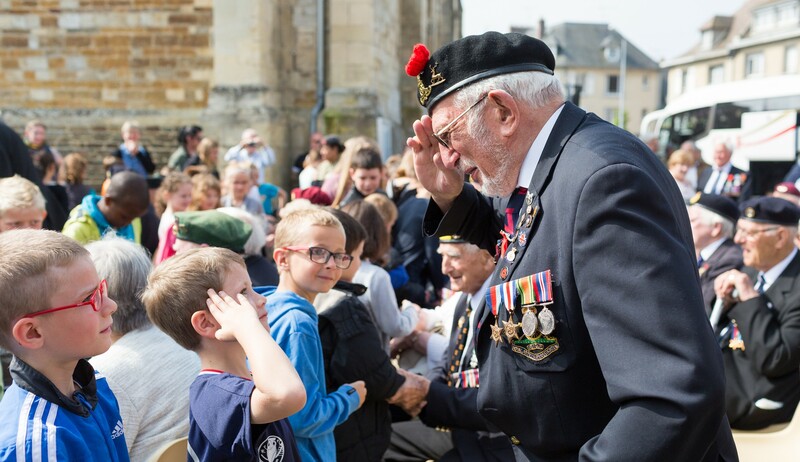 In this early action of D-Day, the first house on French soil was liberated, and the first British soldier of the Normandy Invasion was killed in action: Lieutenant Den Brotheridge. It was No. 1 Platoon which knocked out a machine gun position firing from the bridge and rushed across to capture the far side, firing from the hip and lobbing grenades during the charge. 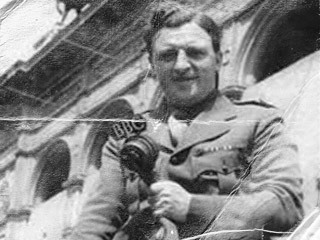 Lt. Brotheridge was mortally wounded by gunfire as he made a grenade attack on a second machine gun position. The bridge had been prepared by the enemy for demolition, although the Royal Engineers removed the unset charges. In honour of the distinctive emblem of the Parachute Regiment, the distinctive bridge at Benouville was renamed and will forever be known as “Pegasus Bridge”. In a further tribute, 45 years after the successful attack, the Mayor of Ranville unveiled a plaque to commemorate the capture of the Orne River Bridge, now named “Horsa Bridge”. “We landed about 40 minutes after midnight, just about 70 yards from the Bridge. After brief rendezvous in an orchard nearby, we had to go at the double onto the bridge to relieve the Ox & Bucks who had already taken the bridge. They had obviously had quite a fire-fight; we passed an armoured half-track on fire. Hit by a PIAT, the vehicle was exploding all over the place as its ammunition went off. 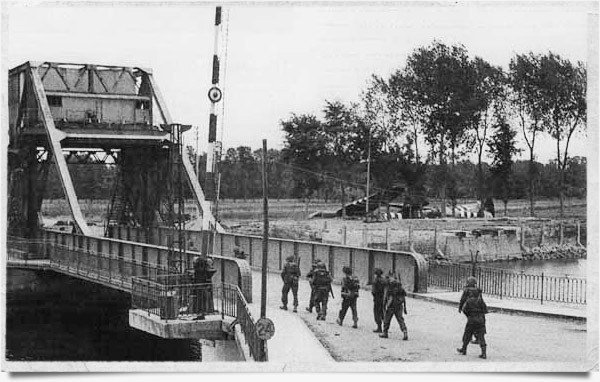 Within half an hour of the bridge being taken, 6th Airborne parachutists landed to provide reinforcement. The Ox & Bucks were reinforced half-an-hour after the landings by 600 men of 7th Battalion, the Parachute Regiment who were the relieving force to bear the brunt of German counter-attacks to the west of the Caen Canal throughout the 6th of June. The Battalion distinguished itself in holding a wide bridgehead around ‘Pegasus Bridge’ against constant enemy attacks which were often armour supported. In particular the “A” Company, based in the nearby village of Bénouville, suffered the most severe fighting and were eventually cut off from the remainder of the 7th Battalion. 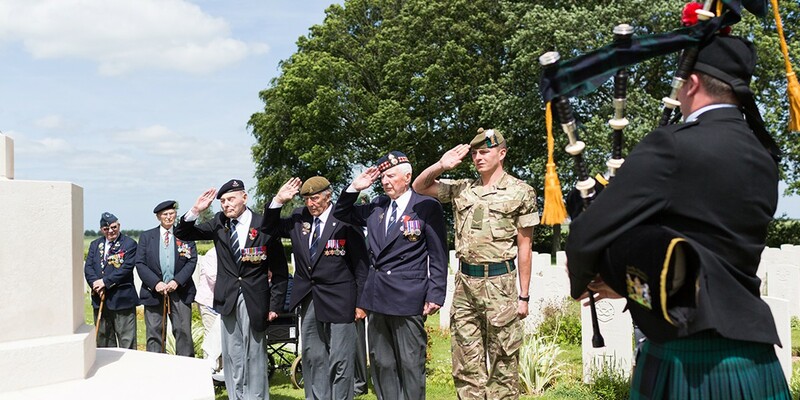 The first relief in force was from 6 Commando, led by the commander of the 1st Special Service Brigade, Lord Lovat, who arrived to the sound of the Scottish bagpipes, played by the 21–year-old so-called ‘Mad Piper’, Private Bill Millin. The remnants of the 7th Battalion’s “A” Company continued to hold out until 9:15pm on the 6th June when British infantry, in the form of the 2nd Battalion The Royal Warwickshires, arrived from the invasion beaches and secured Bénouville, and so allowed the evacuation of “A” Company’s many wounded. Ivor Anderson enlisted in the Royal Engineers 1938, aged 14, as a boy apprentice. 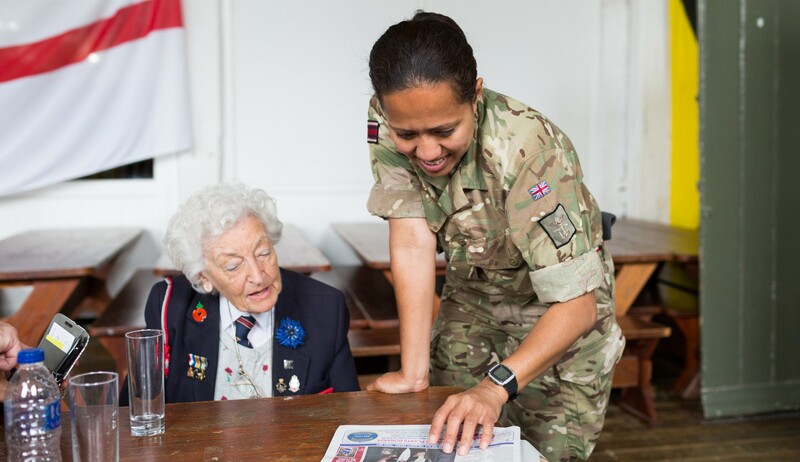 After training at Chatham and Chepstow Technical College, in 1943 Ivor volunteered for the Parachute Regiment and carried out most of his training at Manchester Ringway & Tatton Park. “We were really well trained and everything was well organised and in place for this attack. Even though none of us had any details, we knew enough to realise this was the big event. We had been transported by trucks over to RAF Fairford and were all ready for the off when we were stood down due to the postponement of the whole show. Mustering back at the airfield the next afternoon, we finally took off shortly before midnight in a Stirling. “Our job was to clear the ground for our gliders to land near Pegasus Bridge. Photo reconnaissance had shown the enemy had laid out heavy posts of concrete or steel all over the proposed landing area. We were all in good spirits and had a good old sing-song once we were on our way. Once we crossed the enemy coast, there was heavy flak. That quietened us down and, frankly, I couldn’t wait until time to jump. We knew we would be safer out of the ‘plane and on our way. A museum and memorial can now be found next to the site of the battle on “Major Howard Road”. The most prominent item on display is the original bridge itself. In 1993 it was officially replaced by a larger, more modern bridge which emulated the design of the original one. The soldiers killed in these actions are mostly buried in the cemetery at nearby Ranville. Lieut. Brotheridge’s grave, located in the churchyard next to the cemetery, has a commemorative plaque that was installed by the family Gondrée whose house near Pegasus Bridge was the first to be liberated during D-Day. The Gondrée house still stands and now accommodates a café and a museum shop selling Pegasus memorabilia. This was a fortification about six miles north west of Ranville. Intelligence gathering indicated that it housed a number of 150mm heavy artillery guns, all ranged at SWORD BEACH and capable of inflicting heavy casualties on the landing forces. The British plan of assault would start with an aerial bombing raid shortly after midnight as D-Day started, followed by an infantry assault by the 9th Battalion under Lt. Colonel Terence Otway. This combined assault, supported by gliders and the Royal Engineers, was planned to hit the installation of gun emplacements and bunkers by 0400. In case of limited success or abject failure, MS Arethusa was scheduled to open fire on the Battery at 0530. The 9th Battalion Royal Ulster Rifles was part of the 3rd Parachute Brigade. It was a complex plan, yet a tough nut to crack and only one hour to disable the batteries before the first troops landed on Sword. If the guns could be put out of action, thousands of lives could be saved. In the event, much went wrong from the beginning. Weather and poor visibility led to the parachute drop scattering men across an area of 50 square miles. Rommel had ordered the area south of Merville to be flooded as part of extensive enemy defences, so it was a swamp. Of 750 men dropped for the assault, only 150 could be assembled at the approaches to the Merville Battery, whilst many of those who landed in the swamp sank under the weight of kit. Many others simply lost their way and were later captured. The gliders missed the target and the attack finally took place at 0430, with limited weaponry and a tenth of the original force. Nevertheless, the attack was determined and victory was snatched from the jaws of defeat, with the objective being taken. Without explosives, the guns could not be put out of action so the breach blocks were removed.